Baseball’s “second half” is only a few weeks old, but there’s little question who has been the star player on the field since the All-Star break. “On fire” isn’t a strong enough saying for how Milwaukee’s Christian Yelich has been hitting recently. White hot? Scorching? Like the heat of 1,000 suns? Whatever phrase you want to use, Yelich is clearly in a zone. In the 17 games since the All-Star break, Yelich has had a hit in 16 of those. And of those 16, he’s had multiple hits in 13, including six straight from July 24-29. Since the break, Yelich is batting .479 — raising his average from .288 to a National League-leading .326. Only three other players in that span are hitting .400 or better, and none have more than 50 at-bats (Yelich is 34-for-71). The Cubs‘ Ben Zobrist is closest to Yelich at .440 (22-for-50), Ian Kinsler is hitting .438 (18-for-41) with the Angels and Red Sox and Cincinnati’s Phil Ervin is right at .400 (16-for-40). While Yelich has “only” six home runs during this time, his .915 slugging percentage is also best in the majors, with only Toronto’s Aledmys Diaz (.884) and St. Louis’ Matt Carpenter (.859) posting a mark over .800. Yelich is also tops in doubles (9), tied for fourth in triples (2), second in runs (18, one behind Texas’ Rognud Odor), tied for fourth in RBI (16) and third in on-base percentage (.500). When it comes to OPS — the advanced metric which is often cited as one of the best indicators of a player’s batting prowess — Yelich again tops the list. Thirty players overall have an OPS of 1.000 or higher since the All-Star break. Of those one-third — exactly 10 — have 70 or more plate appearances (18 have 60+ PA). 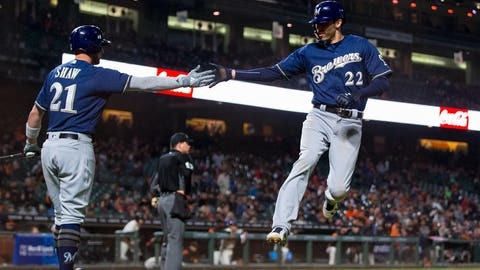 While we don’t expect Yelich to continue this torrid pace for the remainder of the season, he’s already nearing several career highs despite playing in just 99 games, including home runs (has 17, career high is 21), triples (4, 6), runs (78, 100) and steals (14, 21). Also, his batting average, on-base percentage and slugging percentage would all be career highs (previously .300, .376, .483). Yelich also has a chance to accomplish something no other Brewers player has done — lead the league in hitting. He has a decent cushion heading into Tuesday’s games, with Atlanta’s Nick Markakis in second place at .319. But that conversation is for another day (and StaTuesday).